Bristol, Tenn. (July 28, 1963) - Pole-setting Fred Lorenzen out-horsepowered Richard Petty in the closing laps to take a 3-second victory worth $4,540 in the third annual running of the Volunteer 500 stock car race at International Speedway. 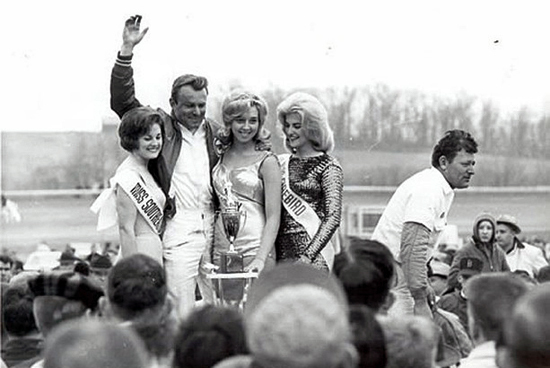 Lorenzen, driving a 1963 Ford, and Petty, driving a 1963 Plymouth were the only drivers of the 21 who finished the race to complete the scheduled 500 laps around the slippery half-mile track. Jim Paschal, also driving a Petty Plymouth finished third. Ford-driving Marvin Panch finished fourth with David Pearson finishing fifth in a '63 Dodge. Lorenzen, leader of the race three times for a total of 336 laps, took the lead away from Petty on the 320th lap when he beat him out of the pits after both drivers stopped for fuel while a piece of metal was removed from the backstretch under a caution flag. Perennial favorite Fireball Roberts went out of the race on the 312th lap and was joined on the sidelines by the early leader Junior Johnson, on the 407th lap. Roberts, spectacular in victory and defeat, entered the first turn too high, skidded into the retaining rail, flipped his car three times, skidded on the roof and came to rest right side up with flames under the hood. Roberts climbed out, dazed - but unhurt - and walked away. Johnson, victim of mechanical miscues all season long, was stopped after 407 laps by a blown piston and a broken crankshaft. Johnson wound up in 22nd place with Roberts listed 29th in the final rundown. Lorenzen started in the inside pole position with Roberts alongside and Johnson behind in the second row. The portly-chicken farmer had said he would lead the race by the second lap – and he did. Lorenzen led the first time past the starter's stand but Johnson pushed his 1963 Chevrolet out front as the three went through the first turn the second time around. Thirty-three laps later, Ned Jarrett tried to pull his 1963 Ford around Johnson going down the front stretch. Johnson nudged Jarrett with the right front of his car and, when Jarrett's car began to skid, shoved him into the retaining wall, sending Jarrett to the pits. The caution flag was out for three laps as Jarrett limped around the track. Nelson Stacy blew a tire entering the first turn on the 48th lap and brought out the second yellow flag while his car was moved and fuel cleared from the track where he slammed into the guard rail high in the turn. The front-running Johnson lost the lead and the air in his right front tire simultaneously in the second turn on the 12th lap. Lorenzen sailed into the lead as Johnson caromed off the rail and pitted. Rubber, rosin and other matter on the turn caught Roberts a lap later and gave him a ride along the rail at about the same spot Stacy and Johnson hit it. Roberts straightened his car up coming out of the second turn and continued. Johnson tried to take the third turn a little too high on the 164th lap after coming out of the pits and spun again before moving down the front stretch. Paschal, driving one of his best races ever, worked his way up from his 13th starting berth to second by the 210th lap. Two laps later his teammate, Petty, side slipped in the first turn and tapped leader Lorenzen up too high, causing him to spin into the wall. But the alert Lorenzen regained control after grazing the rail and kept his lead. A piece of exhaust pipe on the track on lap 240 brought out the fourth caution flag. Lorenzen went to the pits for fuel and tires under the caution flag and Paschal was left with the lead - for one lap. Nauseated by exhaust fumes and heat, Paschal pitted on the next lap for oxygen and Lee Petty took over. But by then Lorenzen was back on the track and easily regained the leader's role.